Fish Sticks make it easier to install wire through walls, above ceilings, or underneath carpet - anywhere you might encounter obstacles that would cause a standard fish tape to "fold" under pressure. Glo Fish Sticks are made from luminescent fiberglass that glows in the dark improving visibility and making it easier to see your intended path or any obstructions to maneuver as needed. 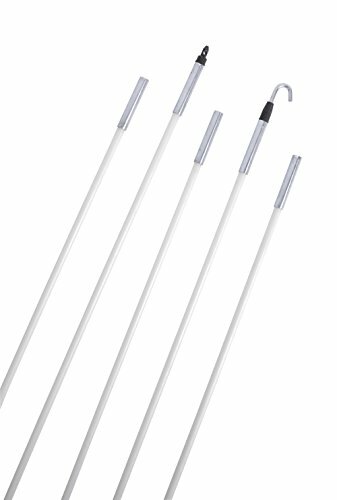 The 1/4 inch diameter of these fiberglass rods is both strong enough to push forward when encountering obstacles and flexible enough to navigate past them. Each five foot rod features an interlocking end allowing you to connect them together to achieve the length needed for the job. This package includes 3 durable rods to provide a stick extension of up to 15 feet in length. Package also includes two changeable end attachments - a bullet nose to guide the stick smoothly on the way towards the end of the run and a hook attachment for pulling or pushing the wire through the run.